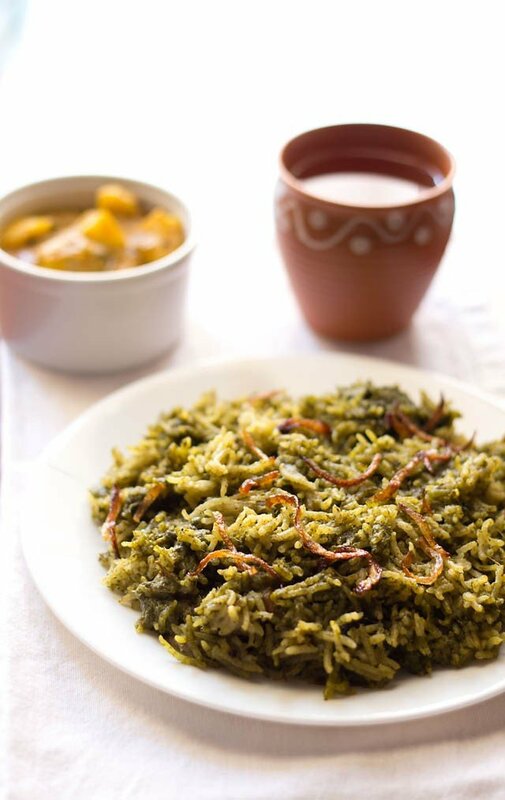 palak biryani recipe - lightly spiced, aromatic and easy spinach biryani recipe. palak biryani recipe with step by step photos – this recipe of palak biryani is one easy biryani recipe. 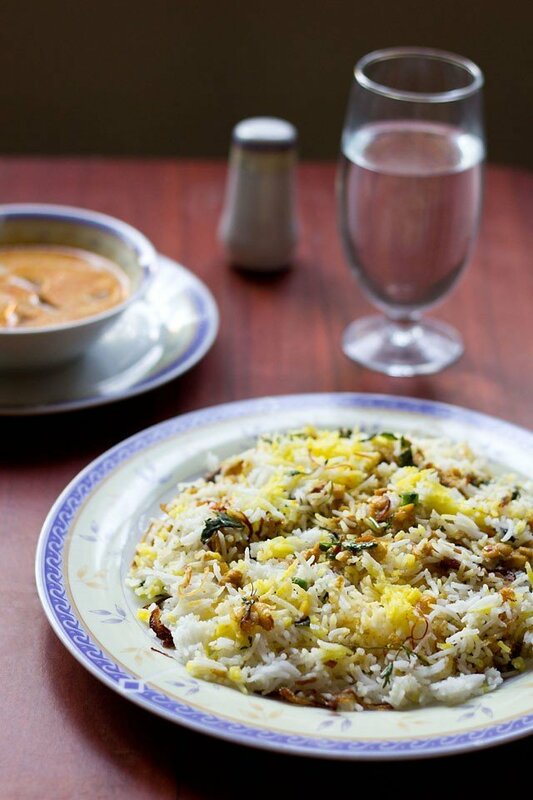 usually making biryani is a very elaborate and time consuming task. although it is worth the time but many times we don’t have so much time and we look for easy solution for our meals. 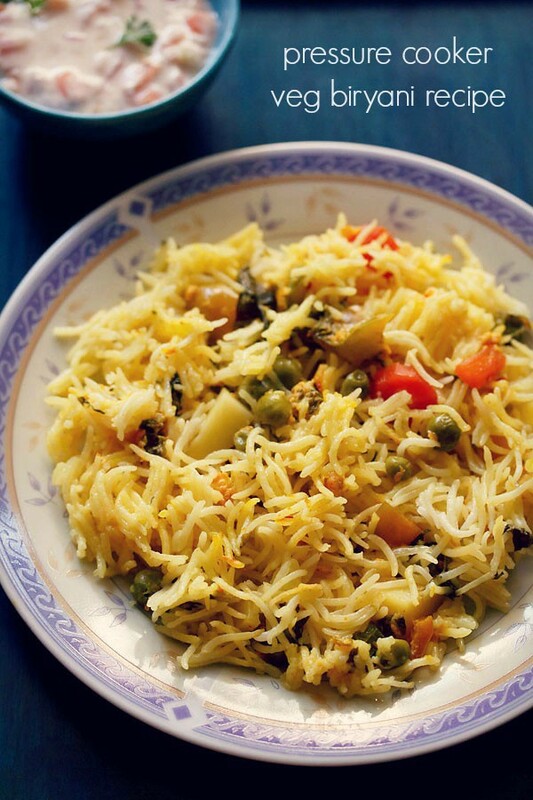 if someday you want to try authentic veg biryani then i suggest you to check this detailed recipe of hyderabadi veg biryani. 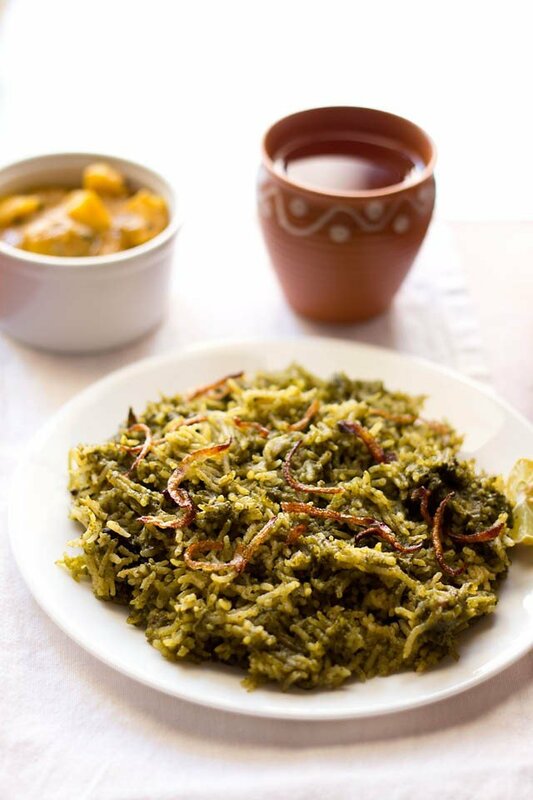 pair the palak biryani with a boondi raita or just kachumber (side salad), pickle and papad and you have one complete meal. 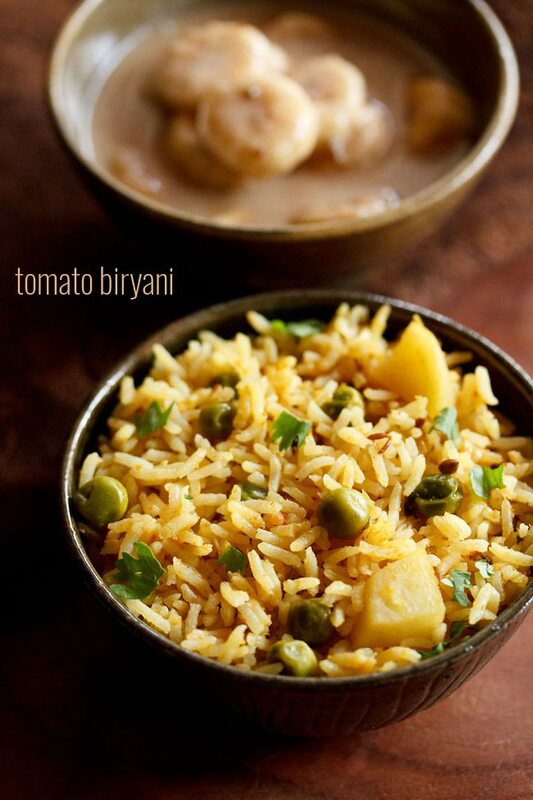 you can also have the biryani with some plain yogurt. there are no layers in this method and you don’t have to cook two or three things. 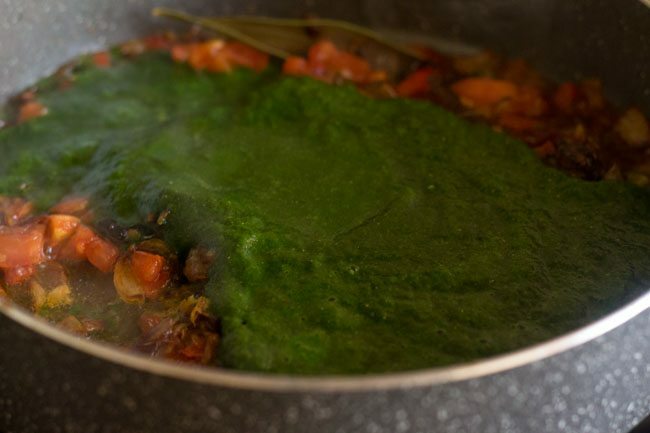 the spinach is pureed and then cooked with the onion, tomatoes, spices along with the rice. 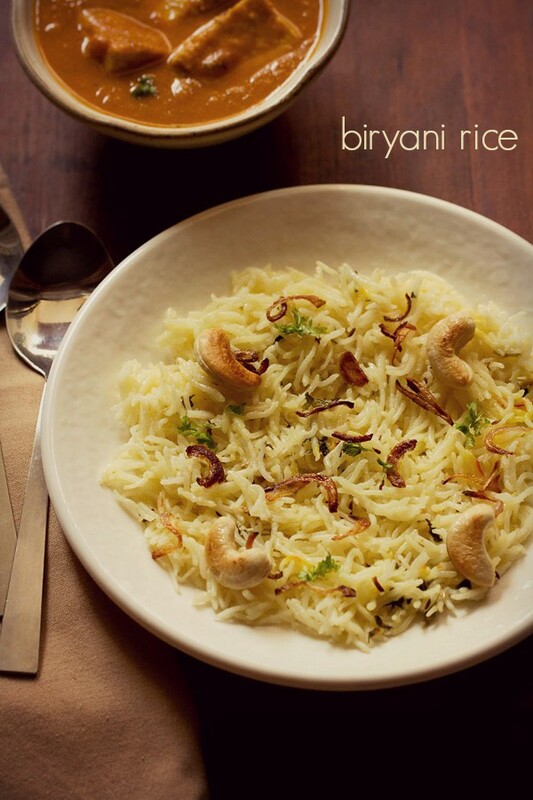 easy and a quick biryani recipe unlike the regular biryanis. 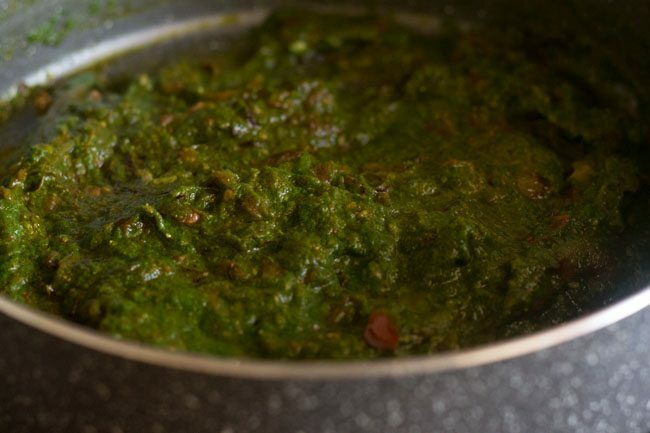 i have also added almonds in the spinach puree just to give a creamy and smooth touch. 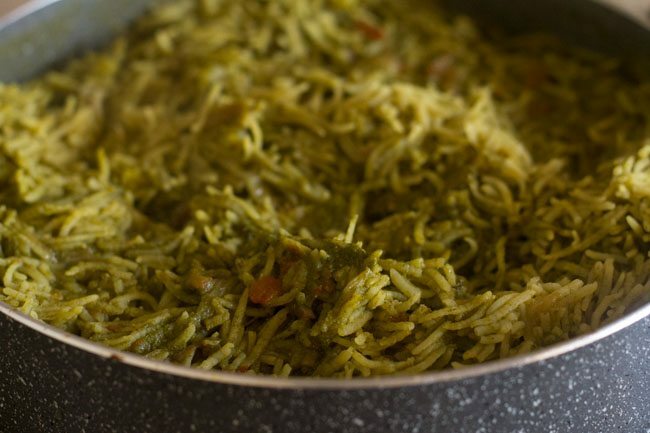 the spinach blends very well with the aroma and flavors of the other ingredients resulting in a delicious biryani. i have slightly overcooked the rice. i used 4.5 cups water. 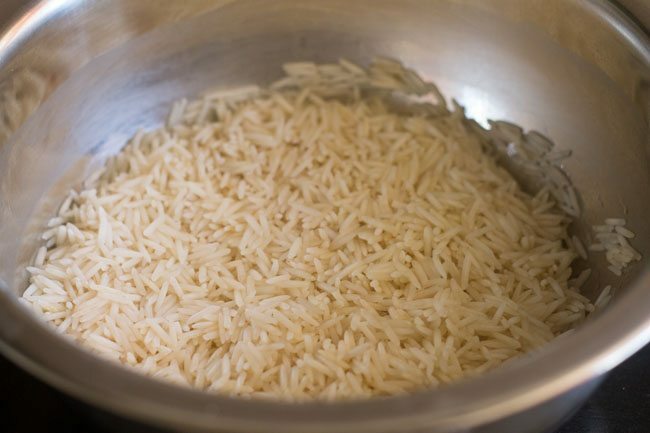 if you use 3.5 or 4 cups water (depending on the quality of rice), you will get separate grains of rice. 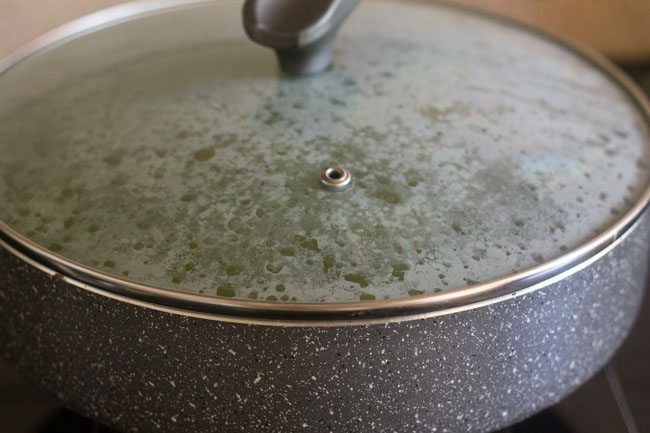 just make sure that you cover the pan tightly with the lid while cooking the rice. 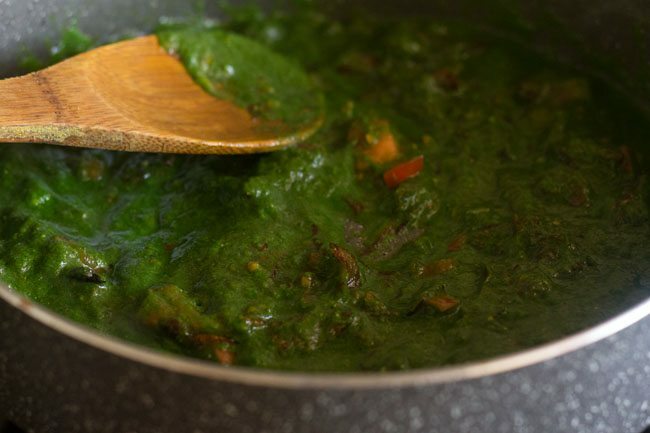 rinse the palak (spinach leaves) very well in water. 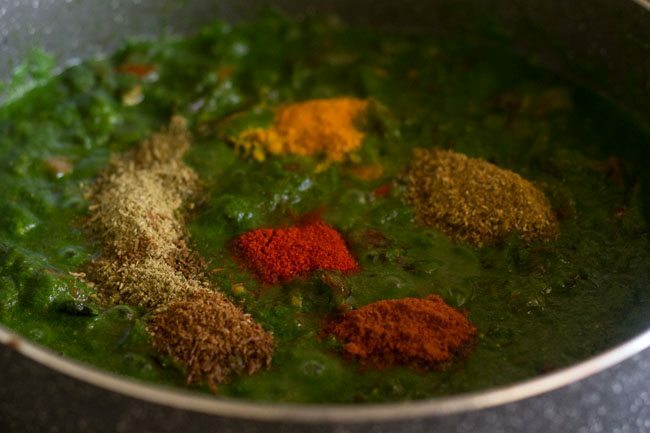 in a blender, add the chopped spinach, mint, coriander, green chili and almonds. add 1/2 cup water and blend to a smooth paste. first rinse and then soak the rice. 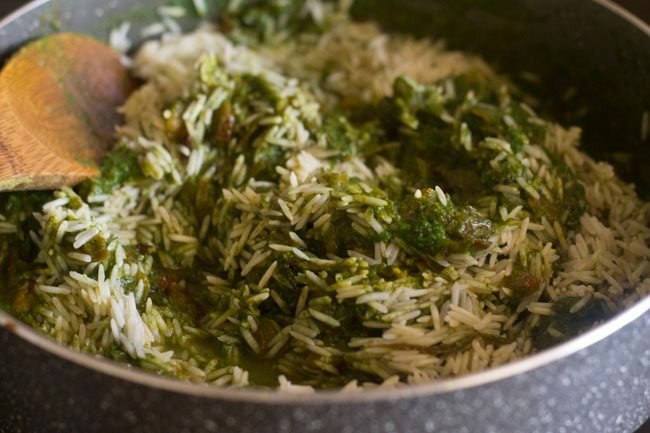 when the rice is soaking, prepare the spinach puree as mentioned above. 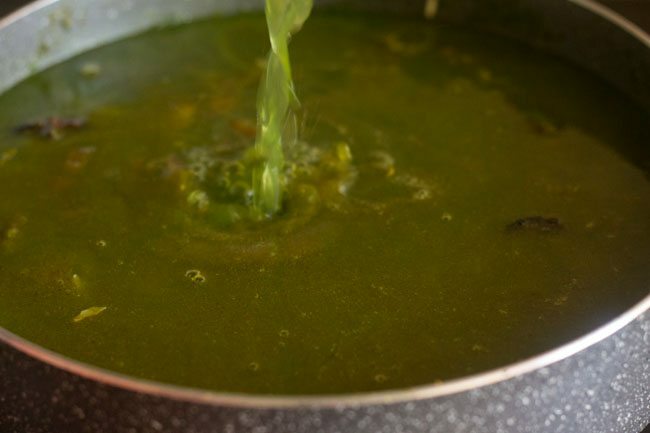 heat oil in a thick bottom and deep pan or pot. add all the whole spices. fry for some seconds or till the oil gets fragrant. 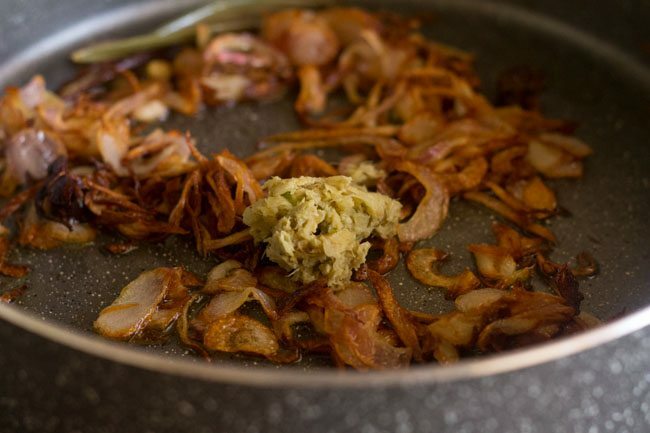 add the sliced onions & fry till they are browned. 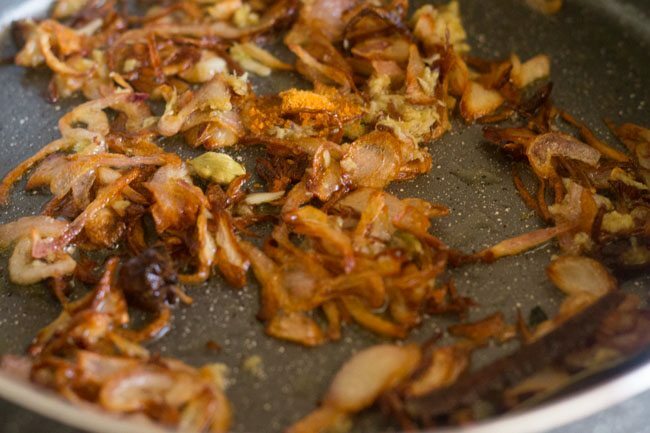 remove some of the fried onions for garnishing. add the ginger-garlic paste and fry for some seconds. now add hing and saute for few seconds. 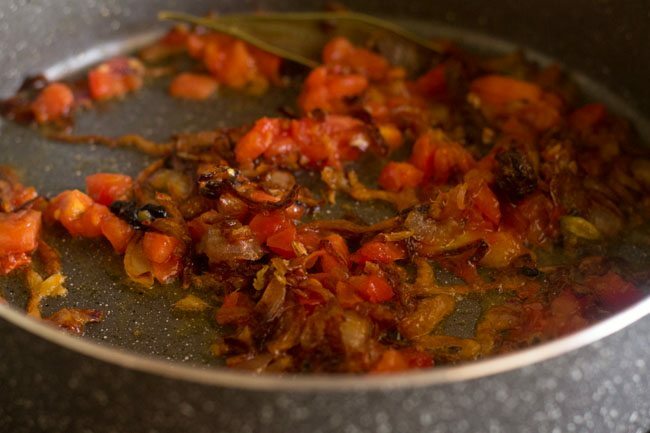 add the chopped tomatoes and fry till the tomatoes becomes soft for 2-3 minutes. keep on stirring so that the ingredients do not stick to the bottom of the pan. 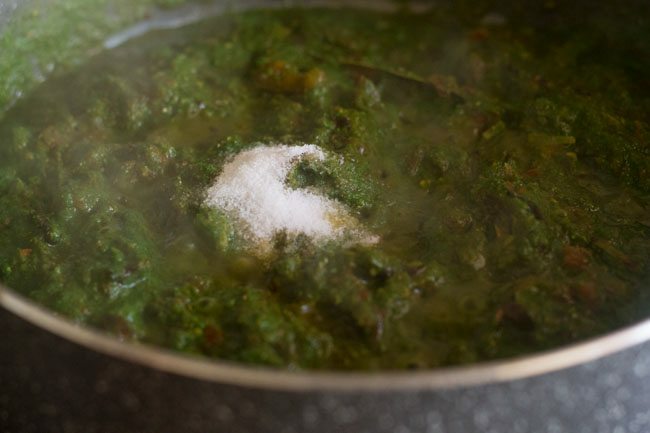 add the spinach puree and stir. saute for 3-4 minutes. now all the dry spice powders one by one and stir. drain the soaked rice and add. stir for 1-2 minutes. pour 4 or 4.5 cups water. check the taste of the broth and if required add some more salt. cover tightly with a lid and cook till the water is absorbed and the rice is cooked. 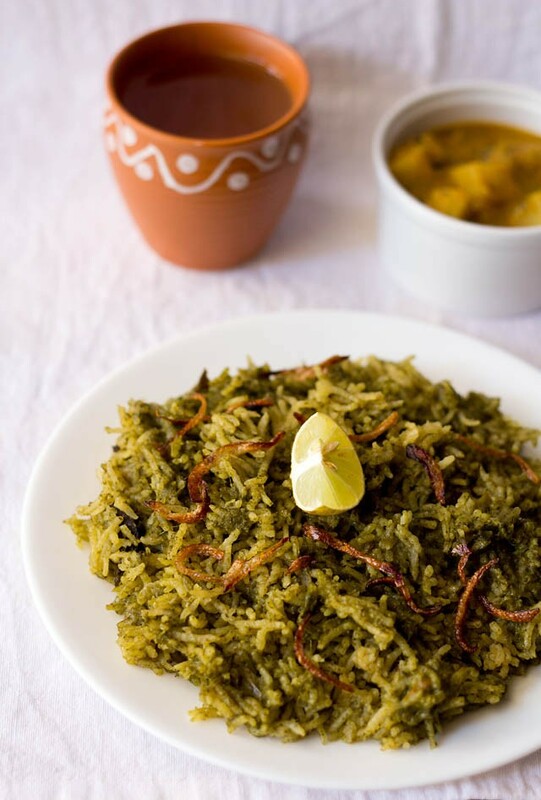 serve palak biryani hot garnished with the fried onions and fried cashews with a side vegetable curry, raita, yogurt curry or some salad. 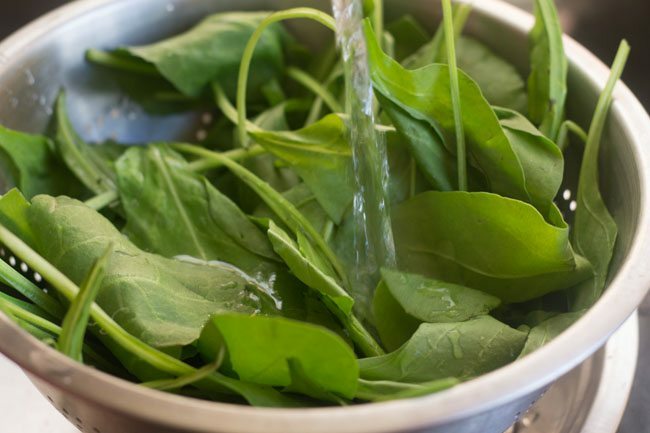 1. rinse palak (spinach leaves) very well in water. 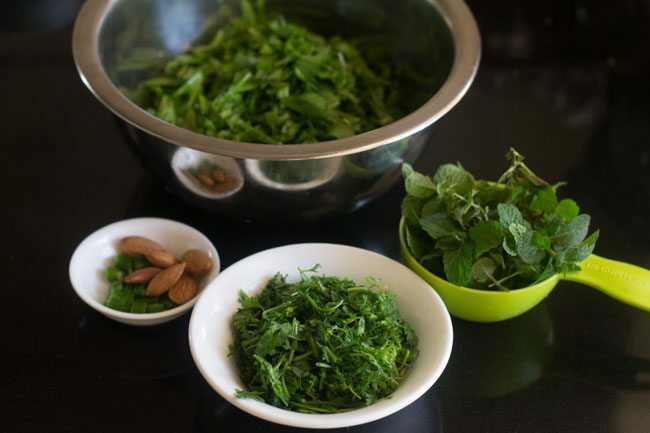 2. measure, rinse and chop 1 medium bunch of spinach leaves, 1 to 2 green chilies, ½ cup mint leaves, ½ cup coriander leaves and 5 to 6 almonds. 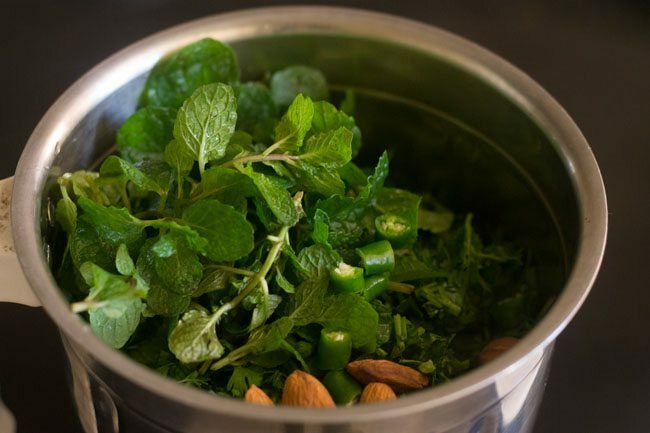 3. in a blender, add the chopped spinach, mint, coriander, green chili and almonds. 4. add ½ cup water and blend to a smooth paste. 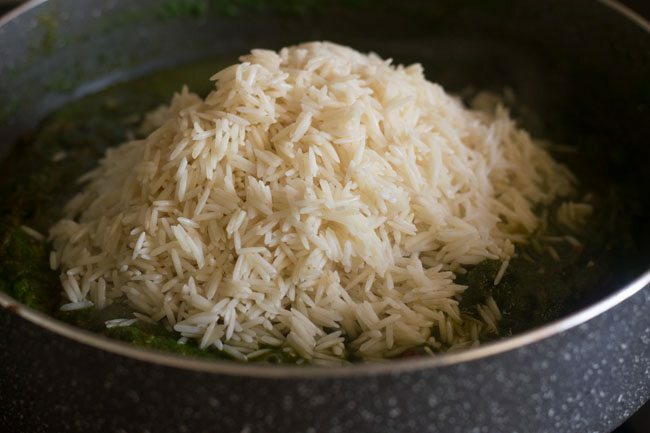 5. first rinse and then soak the rice for 30 minutes. 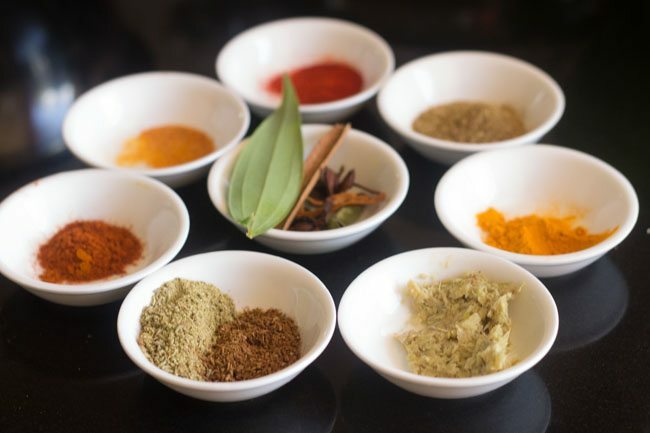 6. keep all the spice powders, whole spices and ginger-garlic paste ready for making spinach biryani. 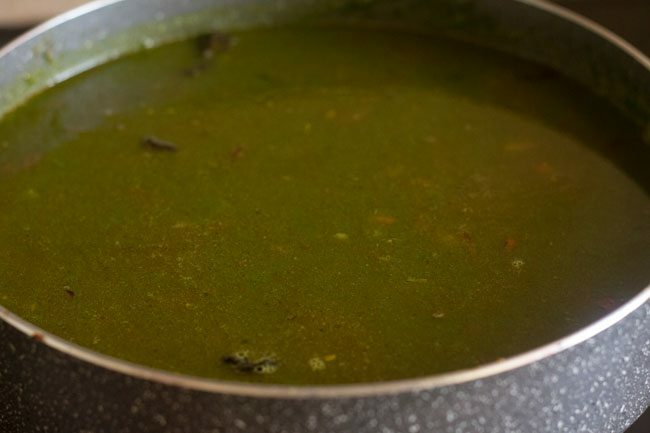 7. heat 3 tablespoon oil or ghee in a thick bottom and deep pan or pot. 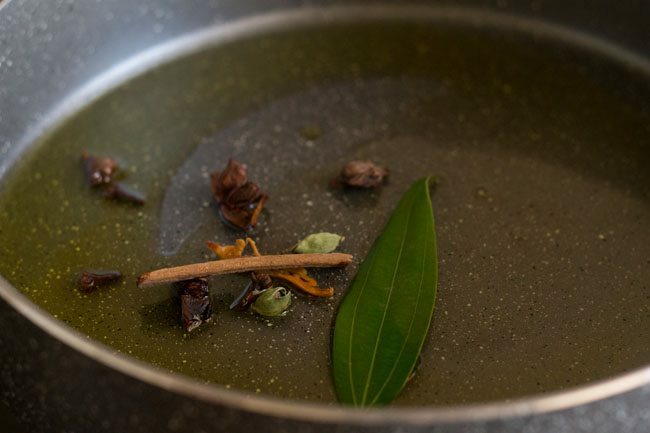 add 1 inch cinnamon (dalchini), 1 small star anise (chakriphool), 2 green cardamoms, 1 to 2 black cardamoms, 2 to 3 cloves, 1 bay leaf and 1 pinch mace (javitri). 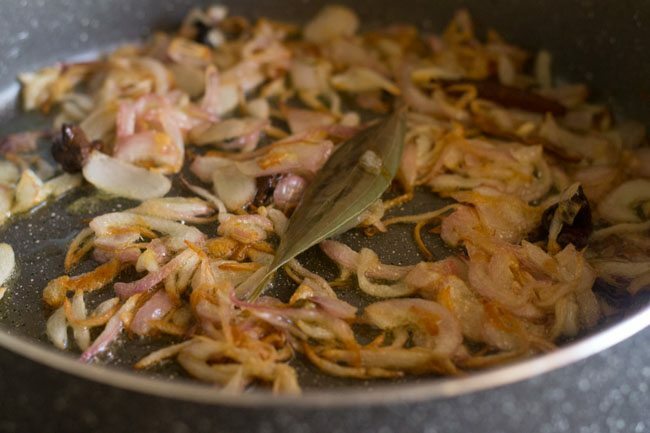 8. fry for some seconds or till the oil gets fragrant. 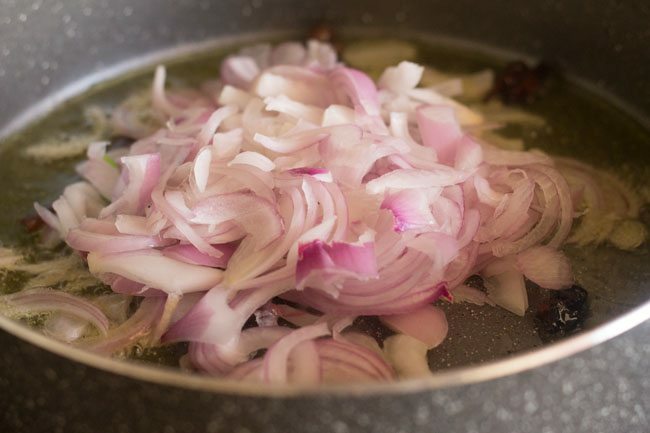 9. add 1 large sized sliced onion. 10. saute and fry till they are browned. 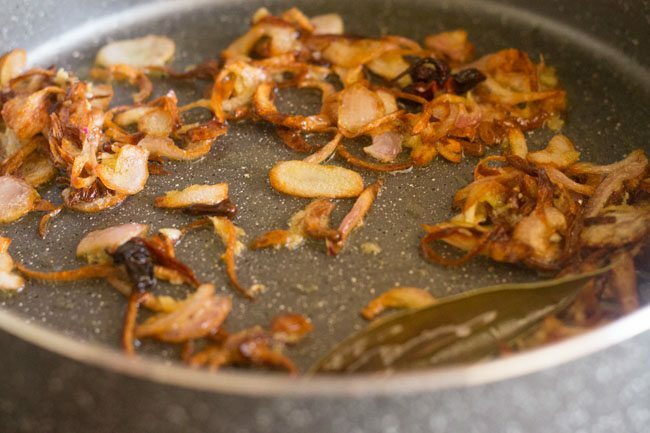 remove some of the fried onions for garnishing. 11. add 1 teaspoon ginger-garlic paste and stir well. 12. add 1 pinch of hing (asafoetida). 13. saute for few seconds. 14. now add 1 medium sized chopped tomato. 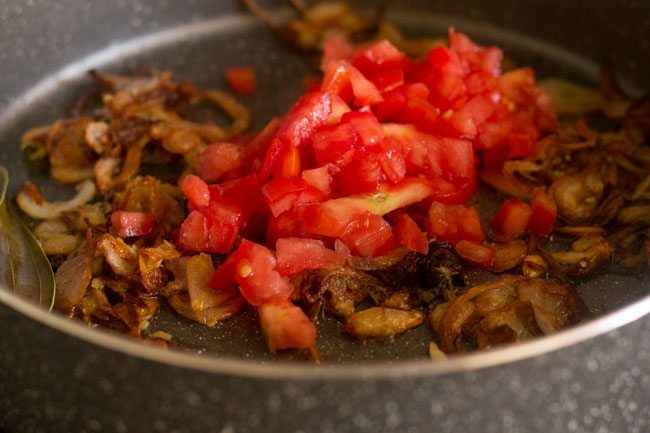 15. fry till the tomatoes become soft for 2-3 minutes. 16. keep on stirring so that the ingredients do not stick to the bottom of the pan. 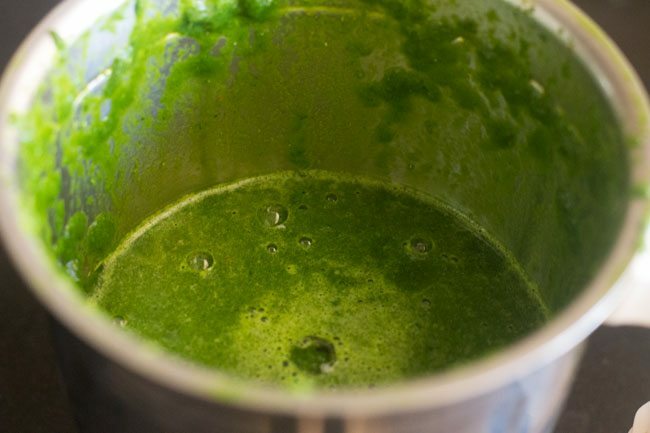 add the spinach puree and stir. 17. saute for 3-4 minutes. 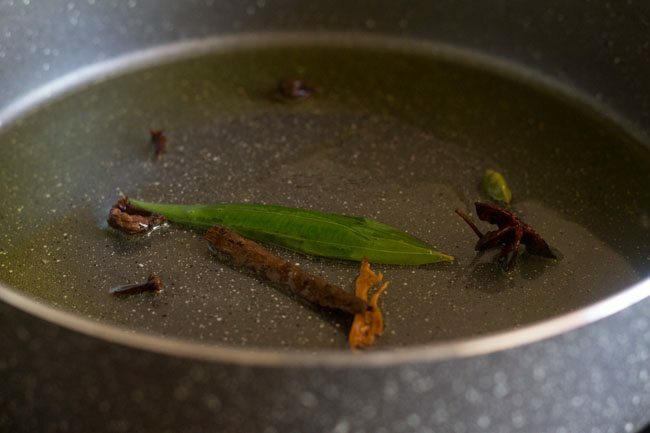 18. now add ¼ teaspoon red chili powder, ¼ teaspoon garam masala powder, ¼ teaspoon turmeric powder, ½ teaspoon cumin powder, 1 teaspoon fennel powder and 1 teaspoon coriander powder one by one and stir. 19. add salt as required. 21. drain the soaked rice and add. 22. stir for 1-2 minutes. 23. pour 4 or 4.5 cups water. 24. check the taste of the broth and if required add some more salt. 25. cover tightly with a lid and cook till the water is absorbed and the rice is cooked. What is the approximate weight of the bunch of spinach you use? I’m in the USA and get spinach in bags. michelle, the weight of one bunch spinach in india will be approx 200 to 250 grams. hope this helps. thank you jaya for this lovely feedback and rating. happy cooking. I tried palak briyani yesterday for lunch .Came out verry well . Very tasty and aromatic . Welcome Annapoorni. 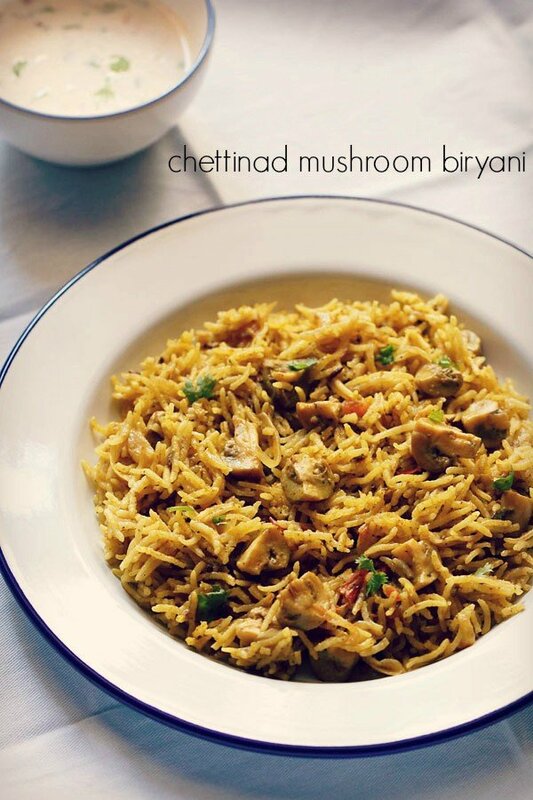 Thanks for sharing positive feedback on palak biryani recipe. This recipe is a bomb. Delicious and hit with the family! Thanks so much for this recipe. My guests n family loved it…. Delicious dish, thanks a lot for the recipe. Not eating too much meat and have always loved Indian cuisine, your blog really helps me making nice veggie food! 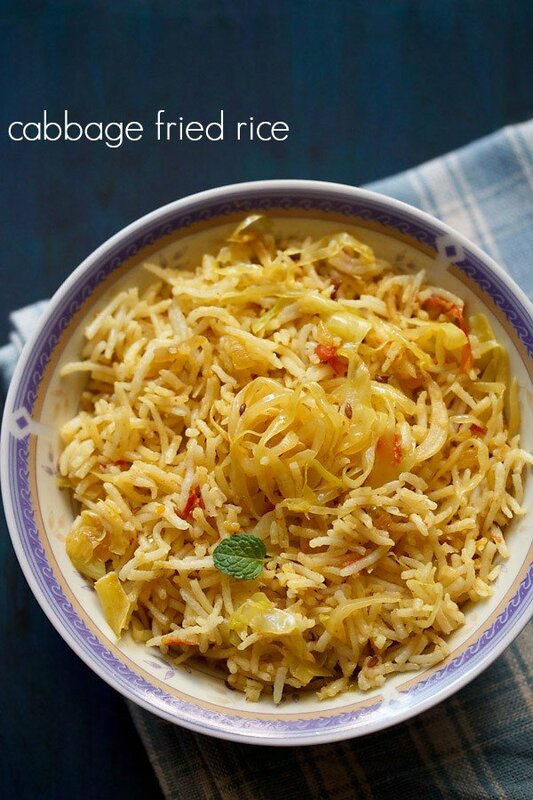 thanks indu for sharing positive feedback on spinach biryani and other recipes. I should say you are a life saver for people like me who are new to cooking and have none to guide. Thanks..your blog not only promises tasty food but informative cooking lessons too. thank you very much dia. 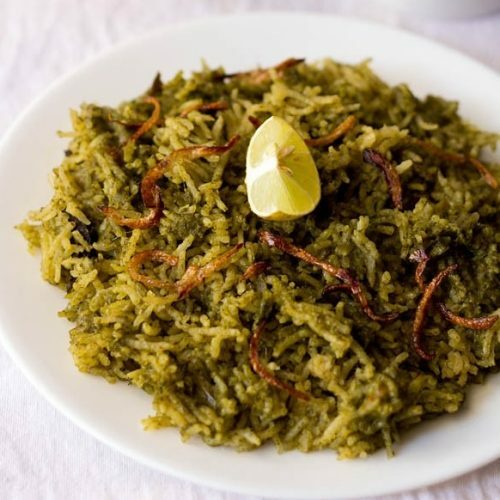 I love to hv Palak biryani again nd again.